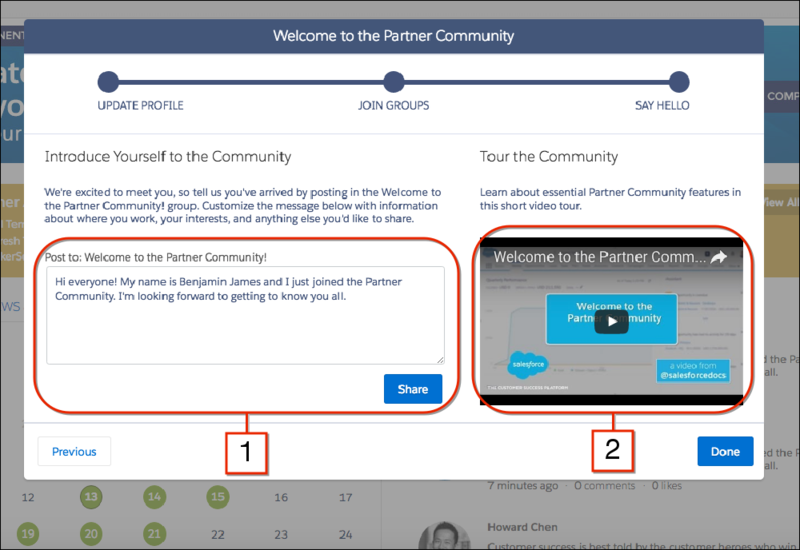 Describe how to sign up for the Salesforce Partner Community. 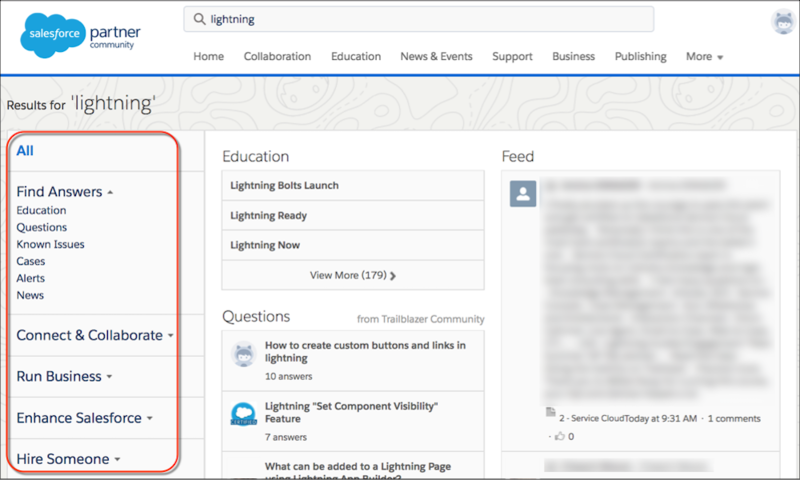 Describe how to personalize your profile in the Salesforce Partner Community. List some resources for getting help in the community. 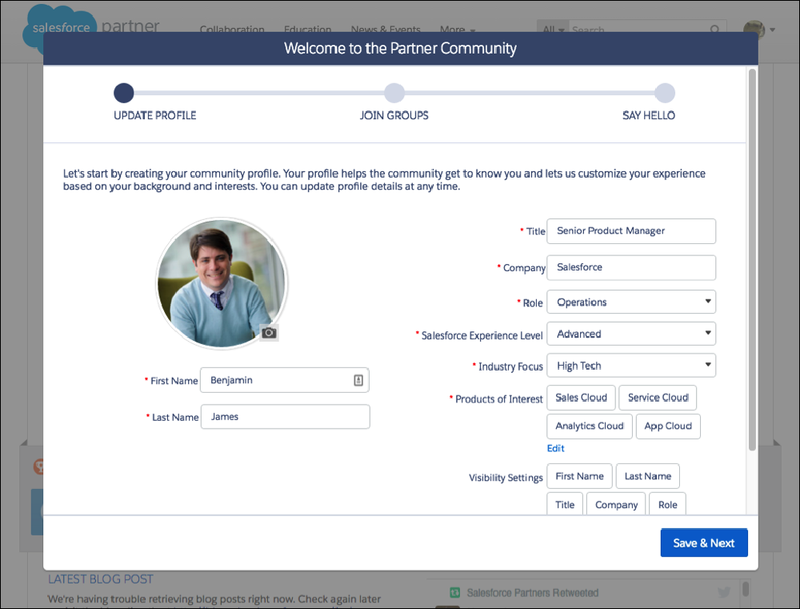 The Salesforce Partner Community is a portal built and maintained specifically for Salesforce partners. It’s where these partners manage their business, learn best practices, get support, and engage with Salesforce employees in a secure environment. It’s chock full of resources for learning how to make the most of your partnership with Salesforce. You can find useful articles, webinars, and events that can give you ideas for your business. You can also get to know other Salesforce partners, and Salesforce employees who work with partners. But don’t take our word for it—head over to partners.salesforce.com and see for yourself. You don’t need to sign up to get an idea of what’s there—around 80% of the content on the Salesforce Partner Community is available to the public. If you’re an ISV Partner selling or planning to sell commercial solutions on AppExchange, sign up for the Partner Community using the AppExchange partner instructions. Then, skip to the Show Your Qualifications section of this unit. Otherwise, to join the Salesforce Partner Community, you need a Salesforce account. If you don’t have an account, sign up for a free Developer Edition org. You’ll receive org credentials that you can use to join the Salesforce Partner Community. Click Join Now, then Join the Partner Community. Click Log In with Salesforce and use your org credentials. Complete the Signup Wizard as a new or existing consulting partner. If you’re a new partner, read and accept the Partner Master Agreement. When your account is set up, you get an email welcoming you to the Partner Community. Log in to the Salesforce Partner Community by clicking the link in the email. The Onboarding Wizard guides you through your first login. First, the Onboarding Wizard asks you to set up your profile. While you’re here, take some time to make it yours. So that other partners can get to know you, share information about your role and interests. And add a picture of yourself so that they can recognize you. The more you get to know one another, the more the Salesforce Partner Community can help you achieve your goals. Next, the Wizard suggests some collaboration groups for you to join. These are discussion groups where you can interact with other partners. We explain more about these groups later. For now, read their descriptions and select a couple you want to join. 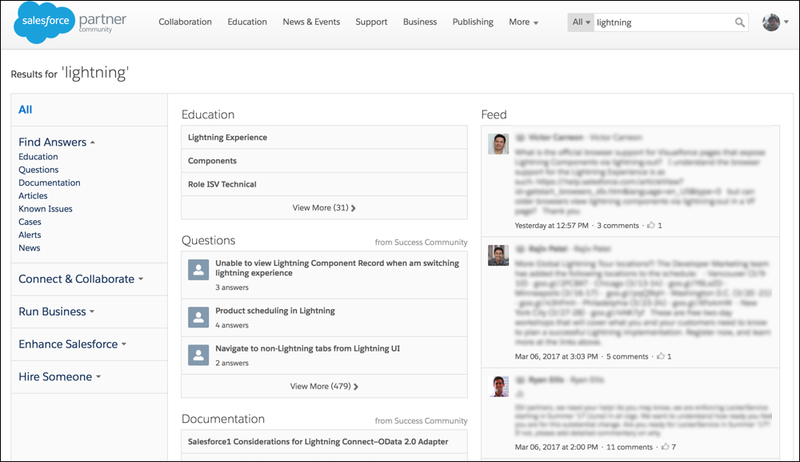 Before the Onboarding Wizard lets you go, it asks you to write a message introducing yourself to the Salesforce Partner Community (1). Personalize your message to make it memorable. The wizard also provides a video (2) showing you around the Salesforce Partner Community. We cover a lot of the video's material in the next unit, but it doesn’t hurt to see it twice! From the Salesforce Partner Community, click the arrow next to your profile photo, and then click your name. Click Edit and select Profile. In the Certifications & Badges section, click Link Trailhead account or Link certification account. Enter the email address for the account that you use for Trailhead challenges or Salesforce certifications. Click Connect Account. You get an email with a verification code. 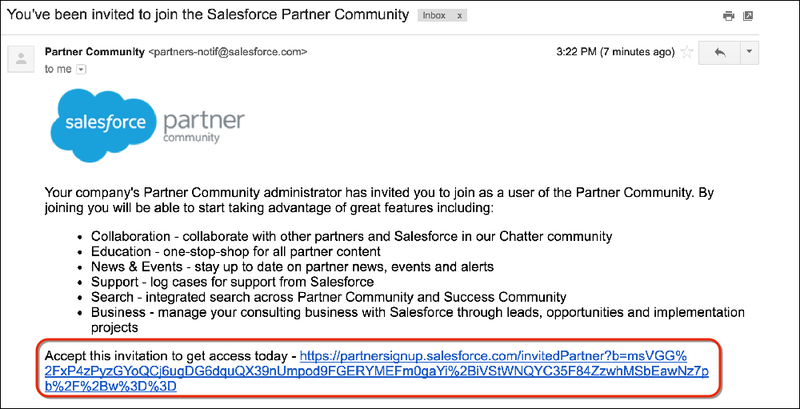 When you get the email, go back to your Salesforce Partner Community profile. Enter the verification code in the appropriate box and click Complete Connection. If you want your badges or certifications to appear on your profile, click Show Salesforce Trailhead Badges on my profile or Show Salesforce certifications on my profile. At the bottom of the page, click Done. Welcome to the Partner Community! General Topics is a comprehensive index of everything in the Salesforce Partner Community. If it’s important to partners, you can find it here. 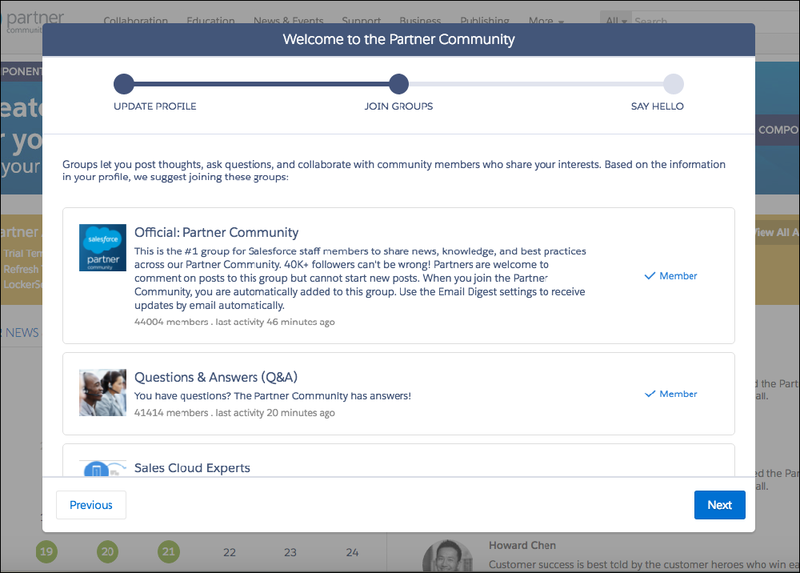 The Salesforce Partner Community User Guide is your quick start guide to the Salesforce Partner Community. It has materials and instructions for new AppExchange and consulting partners. There’s a search box in the upper-right corner of the page. Just type in what you’re looking for, and we go find anything that matches. The search box is on every page, and it always works the same way. Your searches include results from AppExchange and Trailblazer Community. If you want to narrow your results to only one type of content, select a type from the choices on the left. Salesforce offers certifications for partners, organized into several tracks based on different roles. Partner User Groups are great for getting together with other partners in your local area and discussing business, Salesforce products, partner activities, and more. You can start your own group if you don’t find one in your area. Sales Central for Partners is a great place to find information and materials for sales training, industries, demos, and more. Engage with us in weekly Partner Community office hours. There’s a lot going on in the Salesforce Partner Community, and sometimes it’s hard to keep track of all of the updates and changes. Fortunately, we provide a handy cheat sheet you can access if you log in. Use it to sign up for email alerts and update notifications. Spend some time figuring out which of these are most important to you. It can save you a lot of trouble down the road. Now that you’re connected to your community, let’s take a look around and get familiar with the tools you can use in your day-to-day business.